I'll admit it I have a huge girl-crush on Charlize Theron. But seriously, how can you blame me; she's gorgeous and uber-talented. Plus I think she epitomizes Hollywood class and glamour. It's mildly embarrassing to admit but I started to wear my now all-time favorite perfume because she is the spokes person for J'adore Dior. Anyways, I can't wait for her new movie, "Snow White and the Huntsman." It looks like it will be a dark spin on the classic Disney story and the costumes and casts are top notch. I doubt I'll be able to convince my husband to go see the movie but it could be an awesome girls night movie! 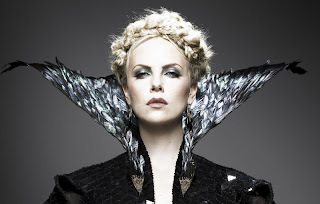 So enough nonsense here's is my Charlize tribute.